Join us for our Annual Charity Auction This Saturday! Our charity auction takes place this Saturday at 6pm! We hope you can join us for good deals, good times, all for a good cause. Just $5 at the door includes paddle and a drink! This event is held annually in support of blind and visually impaired goalball players of all ages and skill levels. 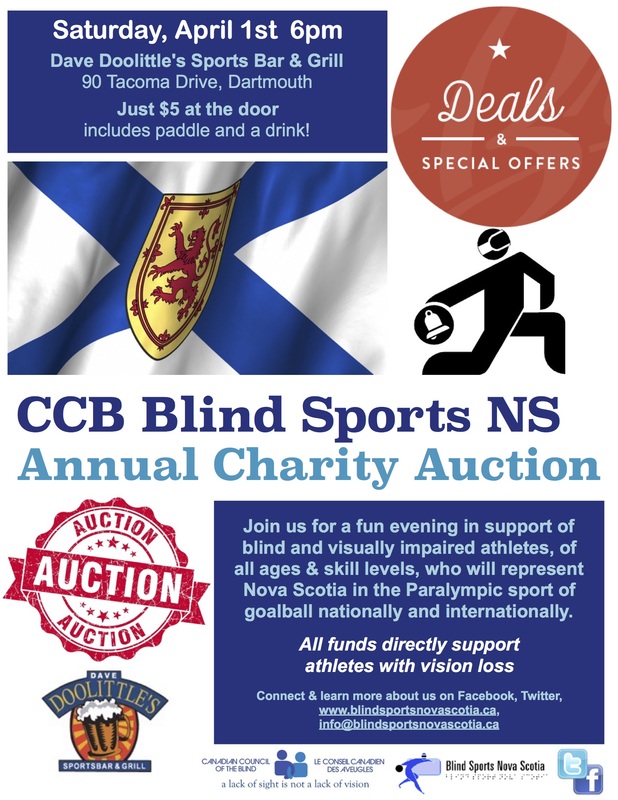 Join us for a fun evening in support of blind and visually impaired athletes, of all ages & skill levels, who will represent Nova Scotia in the Paralympic sport of goalball nationally and internationally. Below that the Canadian Council of the Blind “A lack of sight is not a lack of vision” logo, Blind Sports Nova Scotia logo, as well as Facebook & Twitter logos appear. From Canadian Blind Hockey’s Facebook Page, click on the following link for more about the tournament ADAPTED PUCK DROPS IN 48 HOURS! TIME TO GET REALLY EXCITED! #Blind #Hockey players from all across North America are beginning to arrive in Toronto for the 5th annual 2017 Canadian National Blind Hockey Tournament. And check out AMI’s profile on hockey player Simon Richard from Dieppe, New Brunswick, one of five players representing Atlantic Canada at the Canadian National Blind Hockey Tournament. We get this question a lot. Thanks to the United States Association of Blind Athletes for the fantastic video describing the awesome sport of goalball. Check it out! 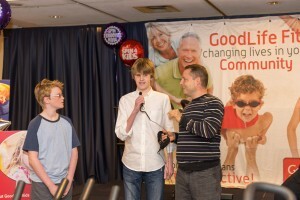 Thank You GoodLife Spin 4 Kids! A huge THANK YOU to everyone who took part in the GoodLife Kids Foundation Spin4Kids event this past Saturday in Halifax! Your efforts help fund inclusive programs, like Junior Goalball in Nova Scotia, where kids with vision loss can get active with their peers. 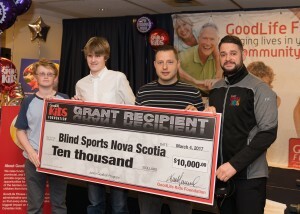 Pictured accepting a whopping $10,000 cheque are Junior Goalball participants, Matt and Nick, CCB Blind Sports NS Chair Peter Parsons, and a representative from GoodLife Kids. Blind Sports NS Chair, Peter Parsons, speaks to how important the GoodLife Kids grant is to the youth who have the opportunity participate in our recreational and competitive goalball programs.